Sea-to-table menu and the potential for a great sunset view in Clearwater Beach. 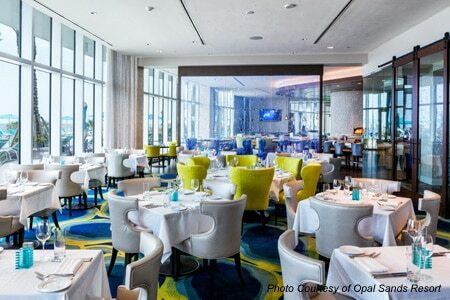 : Opal Sands Resort on Clearwater Beach is lush and stylish, with sculpture and original art throughout the property. Its signature restaurant features a sweeping westward view of the Gulf of Mexico, ideal for sunsets. Meanwhile, the menu emphasizes Italian fare and fresh fish from the Gulf of Mexico, and the space builds its ambience around a large brick pizza oven and a pasta-making station where patrons can watch chefs create many of the staple components of the dishes. Limited dinner offerings bring a handful of specialty pies; the traditional margherita is perhaps the most popular. Entrées often blend Italian and sea choices, as Sea-Guini’s name promises. A typical favorite is halibut over linguine with clams --- or red snapper or grouper, all good options in season. A wine list of about 170 labels ranges from domestic to non-domestic selections, with a focus on those French, Italian and Argentine. Desserts are also tasty, including the expected but well-done tiramisu.